If you’re like most Americans, you have a hard time flossing on a regular basis. It’s been reported that only 30 percent of the American population flosses regularly. Why is it so hard for people to floss their teeth? For some, it’s just another inconvenient thing to do right before bed. For others, it’s because it hurts to floss. While all of these seem like valid enough reasons not to floss, you might not be aware how dangerous it is for your oral health. Brushing your teeth doesn’t get rid of all the leftover food or plaque, especially in hard-to-reach places. If you aren’t able to clean that away, your teeth have a much higher likelihood of suffering from tooth decay. Flossing can change that. Flossing helps you reach those tucked away corners and crevices in your mouth and in between your teeth where food and bacteria like to lurk. Brushing can’t touch these places, and taking the extra effort to floss can significantly increase your oral health and hygiene. This is the most common benefit to flossing, but there is one more that you need to consider. Your gums also benefit from this oral hygiene practice and it can help prevent the occurrence of dangerous gum disease. If left alone long enough, gum disease can lead to a complete loss of your teeth. 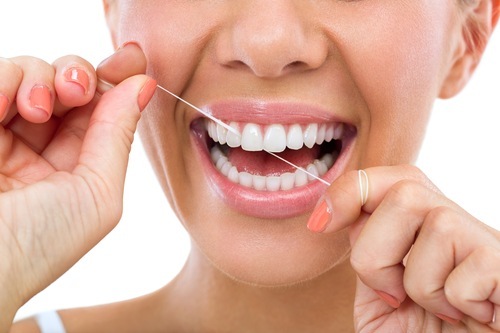 A good flossing habit is made up of several different factors. First, you need to start the habit and stick to it. You can’t expect to see the benefits from flossing if you don’t do it in the first place. Second, you need to choose the right floss for the job. You might think that all floss was created equal, but this couldn’t be further from the truth. There are tons of different types of floss out there and you’ll need to choose one that fits your teeth. If you need help choosing the right kind of floss, ask your dentist for a recommendation. Finally, you need to know how to properly floss. Use a piece of floss between 15 and 18 inches long. Slide the floss inbetween your teeth. Wrap it around each one of your teeth, using a “C” shape. Polish the tooth with an up and down motion. If you haven’t flossed in a while, you might experience some light bleeding. This is normal, and it shouldn’t be something to worry about. However, if the bleeding doesn’t stop after a few flossing sessions, you should ask your dentist if it’s something that needs to be looked at. If you just can’t seem to get the hang of this whole flossing thing, don’t hesitate to ask for tips and tricks during your next dental appointment. We can show you exactly how you should be flossing and give you recommendations for the best kind of floss that provides real results.